Recently, City of Morristown’s City Administrator, Tony Cox, attended the International City Manager’s Association (ICMA) Conference in Seattle, WA. 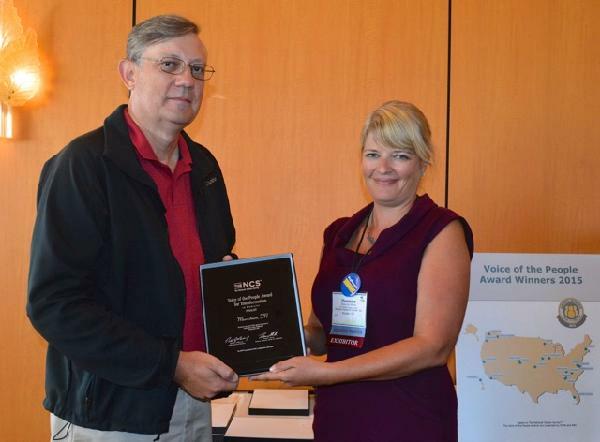 At this conference, the City of Morristown was presented with a Finalist Award from the Voice of the People for its “Transformation in Mobility”. The Voice of the People Awards are given to jurisdictions that best listen and act to improve their communities. Awards were given based on citizens’ responses to the National Citizen Survey which is sent out each year to a sampling of residents. According to results of this survey, Morristown has improved in its walkability, street maintenance, and response to citizens’ concerns over the past year. The City of Morristown has taken great steps to improve the mobility in our town. Through the establishment of a Traffic Team, the City has been able to respond more quickly to traffic and mobility concerns. Improvements to the Skywalk system have made more areas in our downtown ADA Compliant and handicap accessible. An emphasis on sidewalk and greenway development along with an annual sidewalk repair program has put an emphasis on walkability throughout Morristown and the Public Works Department has continued to run an efficient operation in regard to snow removal, street cleaning, and street lighting. All of these improvements, seen by our Morristown residents, are what helped Morristown to receive this award. To continue improvement, Morristown is currently completing an Intelligent Transportation System (ITS) that will improve traffic signalization along Hwy 11E. Plans are in the works to rehab high-traffic areas with the additions of sidewalks, pedestrian crossings and dedicated bicycle lanes. The City of Morristown will continue to utilize survey data from the National Citizens Survey to pinpoint which areas are of concern to our citizens. The City recently mailed out this year’s National Citizens Surveys. If your household received one, please complete the survey and return it by the end of the month. Your responses to these surveys are what help the City to make improvements. You can see the results of last year’s survey by visiting the webpage at http://www.mymorristown.com/residents/national_citizens_survey/index.php.